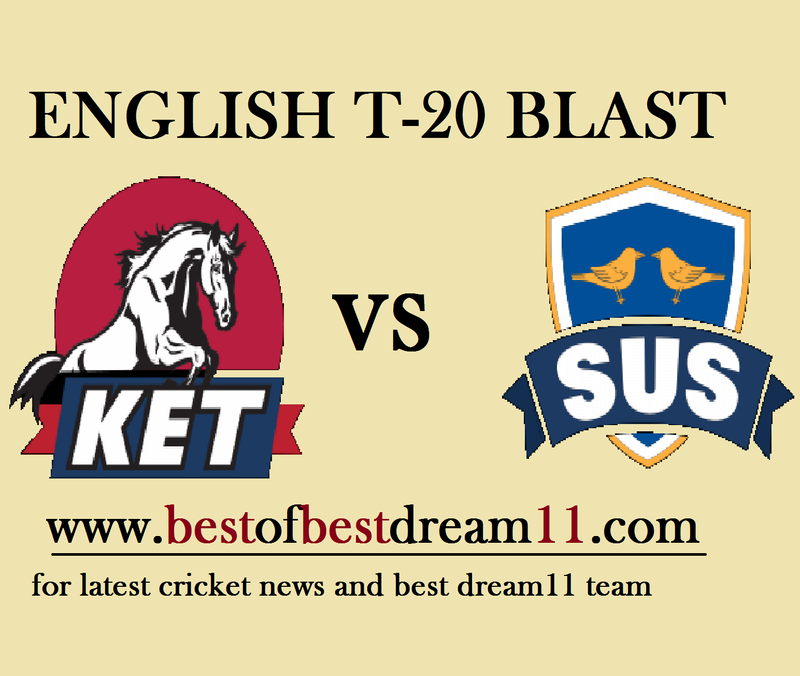 Here is best "KENT VS SUSSEX "South Group,English T-20 Blast 2018, DREAM11 Predictions for the Fantasy user ,who venue are looking to make a strong team for maximum win. We are providing latest news, match update, information about the match .The team is picked by using various factors on the basis of performance, ground stats and latest form. On the other hand , the Sussex team has also won 3 matches out of 5 matches and is fourth position in the point table.After winning three consecutive matches,Sussex team lost to previous match against Surrey by 52 run. Both teams are very strong so we can get very exciting match to see them." 1-For Sussex,Philip Salt played a magnificent inning of 74runs(47balls) while batting brilliantly . 2-Luke Wright and Laurie Evans are in great touch with bat and have scored two fifties in the last three matches. 3- in bowling,J Archer,Rashid khan and Danny Brigs will be crucial bowler. 4-For Kent ,Imran Quyyam took 3 wickets while bowling superb in last match. 5-Daniel Bell,Sam Billing and H Khun have done fantastic batting till now. 6-C Brathwaite ,Joe Denly will be crucial bowlwer for their team. 1- Kent has declared a team of 13 members.Marcus Stoins has returned to the team. 2-Sussex has declared a team of 15 members , in which Tymal Mills returned. NOTE : Stay connected for latest team news. NOTE - How do you think this article would tell us ?If you have any suggestions ,then tell them in the comment box.